Classically educated, Mark Wilks (c.1760-1831) joined the Madras army of the East India Company and would go on to serve as political resident at the court of Mysore from 1803 to 1808. He also later served as governor of Saint Helena from 1813 to 1816, during which time he witnessed the arrival of Napoleon Bonaparte. Elected to the Manx parliament in 1816, Wilks became its speaker in 1826 and was elected a fellow of the Royal Society in the same year. 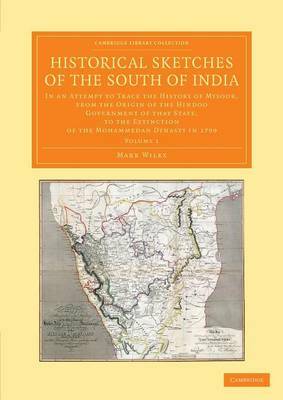 Drawing on state records and his own experiences, he first published this acclaimed three-volume history of the kingdom of Mysore between 1810 and 1817. Volume 1, an 1820 reprint of the 1810 original, covers the early Hindu dynasties, the Mughal period, the emergence of a separate Mysore under Hyder Ali (c.1720-82), and early French and British dealings in southern India to 1767.